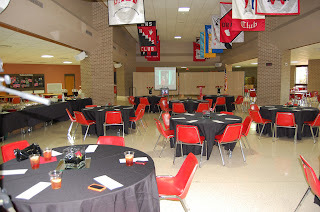 Banquet Halls host a wide variety of events ranging from wedding receptions, wedding and baby showers, bar mitzvahs and bat mitzvahas, retirement parties, communions, graduations, brunches, business receptions, and other celebratory events. 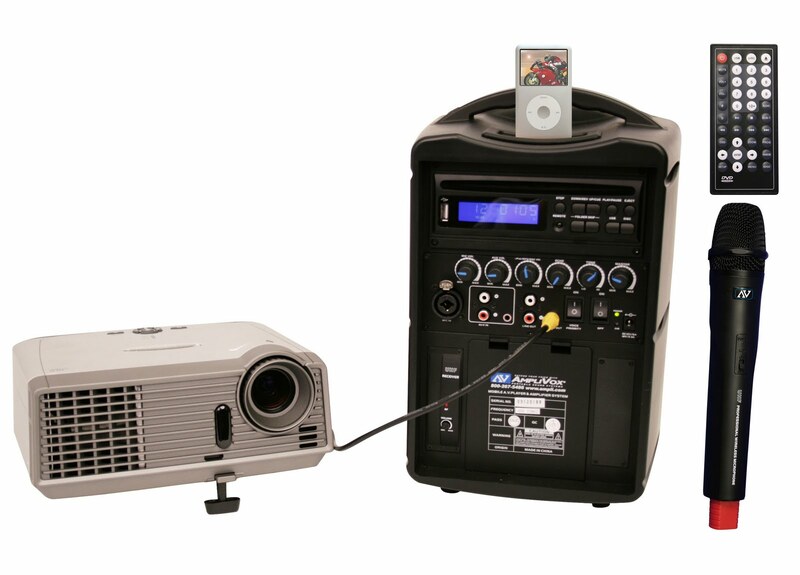 Digital Audio Travel Partner which is a 250-watt sound system that is easily portable, expandable (for new technologies and microphones), and versatile. You can easily plug in external devices like an iPod or iPhone, instruments, and other compatible devices. 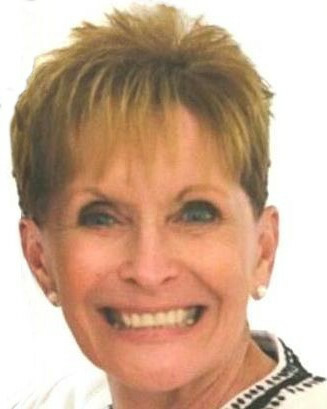 View the Digital Audio Travel Partner on YouTube. Control all of your sound without a sound table in this all-in-one, completely portable system. iPod Portable Sound System is a 30-watt system that plays and charges your iPod or iPhone. It features the Voice Priority Feature that ducks music when speaking into the wireless microphone. 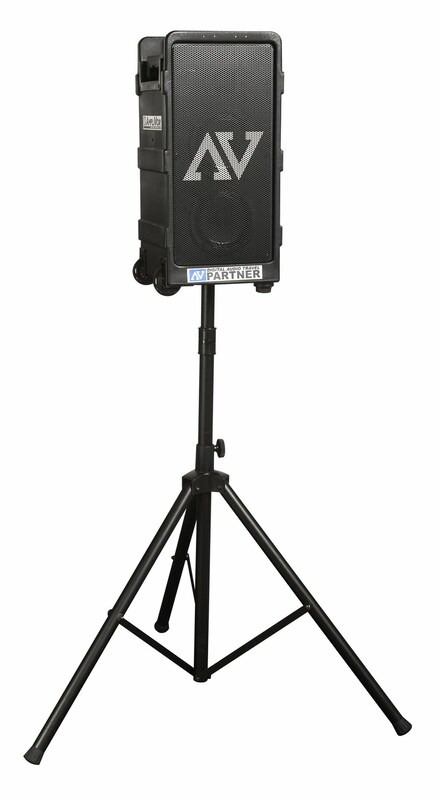 It is one of AmpliVox's best selling products because it is very easy to use. View the iPod Sound System YouTube video here. 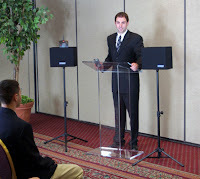 The photo on the left features two great AmpliVox products: the Voice Projector Presentation PA System and our Acrylic Lectern. Both provide the professional look banquet halls need. 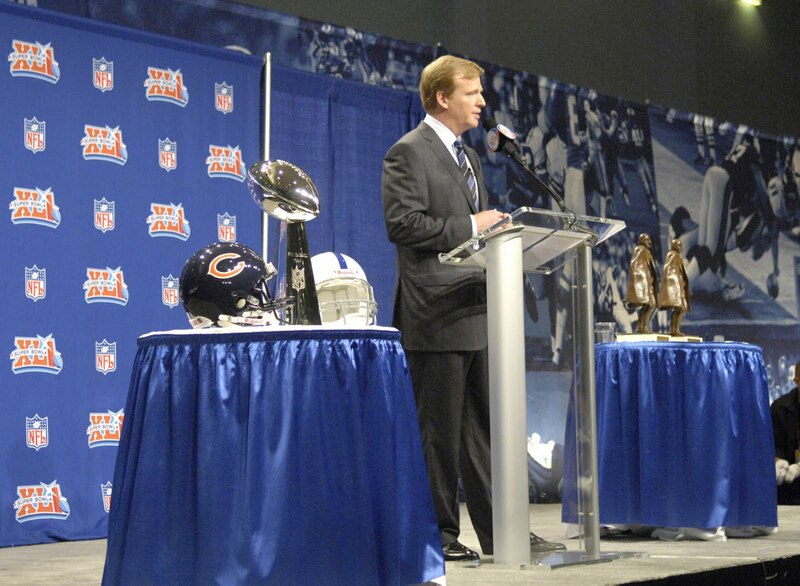 The photo on the right is of NFL Commissioner Roger Goodell using one of our acrylic lecterns at a press conference before Super Bowl XLI. Cool, huh? These products would also be great additions as a Restaurant Hostess Stand, PA systems for wedding receptions, sound equipment for golf courses, and for musicians. View Product videos on the AmpliVox YouTube Channel!